In the journey through the cell suggested by C. de Duve ( A guide tour of the living cell. Scientific American books, vol. 2, 1984) a cytonaut of molecular size traveling toward a cell, before reaching the plasma membrane, would first need to go through a jungle of stems, branches, rain forest vines, and lianas. In tissues, this messy tangle is the extracellular matrix. Extracellular matrix is a scaffold of proteins and carbohydrates located around the cells that is synthesized by the cells themselves. Some authors duggest that this definition only applies to the insoluble components of the extracellular matrix. Extracellular matrix was invented by multicellular organisms. 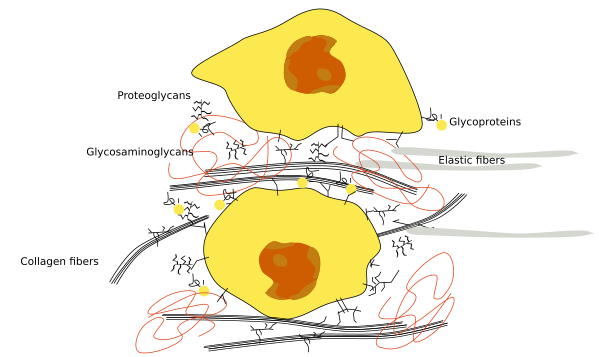 It was needed to keep cells together by adhesion, and therefore tissues appeared. During evolution, extracellular matrix got many other functions, not just adhesion, such as being responsible for the mechanical properties of most tissues (both in plant and animals), keeping cell morphology, allowing cell communication, setting pathways for cell migration, modulating cell differentiation and physiology, keeping growth factors in some places, and many others. In tissues, features like resistance, hardness, elasticity, hydration or optic properties, depend on the extracellular matrix features. 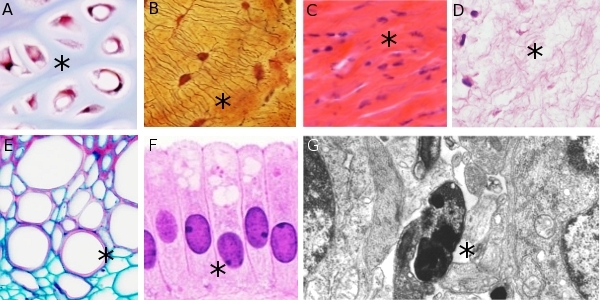 The amount, composition and organization of the extracellular matrix is different in different tissues (Figure 1). There are some tissues, such as epitelia and nervous tissue containing scarce amount of extracellular matrix, whereas in other tissues, such as connective proper, cartilage, and bone, the extracellular matrix occupies most of the volume and is essential for their functions. The molecular components of extracellular matrix change from one tissue to another and are renewed continuously. Synthesizing and removing extracellular matrix is a permanent work done by cells. Figure 1. In this figure, several types of extracellular matrices are shown. They are stained with different histological dyes. Asterisks indicate extracellular matrix. A) Hyaline cartilage. B) Compact bone matrix. C) Dense regular connective tissue (tendon). D) Gelatinous connective tissue from umbilical cord. E) Cell wall from vascular system cells of a plant stem. F) Epithelial cells. Note that there is almost no extracellular matrix among these cells. G) Electron microscopy image from the nervous tissue where extracellular matrix is very scarce between plasma membranes of different neurons. Cells communicate with the extracellular matrix through cell membrane molecules, mostly integrins, which are transmembrane adhesion proteins that recognize and bind to extracellular matrix molecules. In plant tissues, the cell wall can be regarded as a very distinct extracellular matrix, although not everybody agrees. It has very different properties when compared to animal tissues. Cell wall provides stiffness to the cell, plant tissues and to the whole plant body. It is nearly an impermeable barrier and protects against pathogen and mechanical damages, among other functions. Figure 2. Drawing of the main molecules of the extracellular matrix of the connective tissue. The main molecules that form the extracellular matrix of animals are: structural proteins such as collagen and elastin, glycosaminoglycans, proteoglycans and glycoproteins. In plants, the cell wall is made up of carbohydrates (mostly cellulose) and glycoproteins (Figures 2 and 3). All of them are in water solution, together with other smaller molecules, as well as ions. It is the amount, proportion and the type of every type of molecule what make the differences between extracellular matrices. Figrue 3. 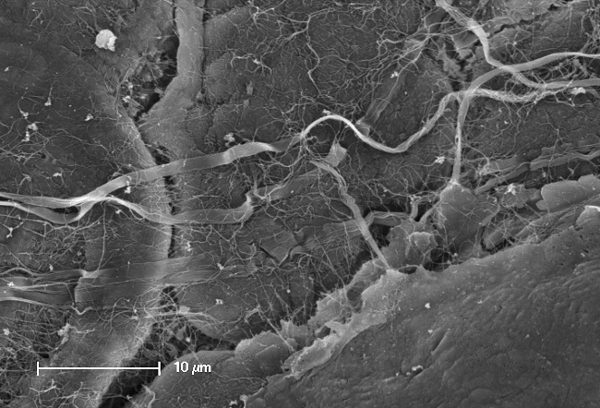 Scanning electron microscopy of the intestine submucose showing large collagen fibers.